Recently we had the pleasure of discussing Indiana University's online MBA program -officially called Kelley Direct Online- with Erin Kilbride Vincent, Director of Admissions and Student Services. Indiana University’s Kelley Direct Online has ranked #1 for consecutive years in our annual rankings of the top online MBA programs in the US. From your perspective, what differentiates Kelley from the other leading online MBA programs? Erin Vincent: Innovation has been our approach to our online MBA since the beginning over 17 years ago. Through our relationships with employers, we are able to evolve the curriculum of our program to deliver what employers are looking for leadership roles within their organization. We also adapt to the changing needs of students. For example, online students who want to advance in their career or change careers desire such things as career coaching. At Kelley, online students are now paired with a career coach along with an academic advisor to help them chart a career path after graduation. From an admissions perspective, what qualities does Kelley look for in a prospective MBA candidate? EV: Because much of the learning students receive consist of team work and projects – just like the business world – ensuring that each class consists of top talent is important. Students learn from each other as well as from the faculty. We look at academic records, GMAT/GRE scores, work and leadership experience. We also want to identify if an applicant is truly open to growing within themselves and has potential to be a strong contributor in the world. This past year, we added an interview component to our application process. This helps us to identify self-starters who are hungry to achieve more, despite obstacles and personal challenges. They are the ones who can identify the critical moments that have and will propel them through their career. As an online program, Kelley obviously has students from across the US and even the globe. What is the typical demographic makeup of a given class? EV: You are correct. Our recent fall class consisted of students from US and around the world. Kelley recently launched a new academic/career advising initiative called Propel. Tell us about it. EV: At Kelley, we want to improve career development at every level of instruction. What online programs have historically lacked are career support services for students. We are finding many students are now looking to change careers instead of just moving up within their current firms. What’s different about our approach is that most schools wait for students to approach them for career advice. Propel features step-by-step proactive interaction that begins with the student meeting with admission coaches and continuing to have touchpoints throughout the program. Propel challenges students to prepare their professional development plan. Learning expectations are applied and include a review of the plan of study and coaching of a student’s work/life balance. An academic advisor helps students to identify challenges and crafts the strategies to help them meet their professional goals. A career coach provides guidance on how to best use the resources for networking with companies and alumni. Each quarter Kelley offers an AGILE course. What is AGILE and why would an MBA candidate be interested in it? EV: AGILE stands for Accelerating Global Immersion Leadership Education. This course allows students to gain real-world international business experience while they are working on their online degree. Students meet with businesses in developing countries that are facing problems. Students learn about the challenges, become immersed in the culture and are challenged to provide actionable solutions that these businesses can apply. This is an outstanding opportunity to network with fellow students and business owners. We have found that many then forge deep relationships which open up new opportunities after they complete their degree and are in their career. MBA candidates in your program have the option of earning a dual degree with an online MS in Business Analytics, Entrepreneurship & Innovation, Finance, Global Supply Chain Management, Marketing, or Strategic Management. What percentage of your MBA candidates pursue the dual degree option? Of these six MS degree options, which are most popular? EV: We are finding more students are expressing an interest in the dual degree because it allows a student to differentiate themselves among their peers. Currently, we have 30-40% of students pursuing a dual degree. The most popular MS degrees are Business Analytics, Finance and Strategic Management. Kelley offers a Washington campus program, which merges business and government. Tell us about it. EV: The Washington campus program is a unique opportunity for students who want to bridge the gap between business and politics. This is an intensive, five-day program, based in Washington DC. The program covers Congress, the federal budget and the regulatory process, and includes meetings with a current or former member of the House and/or Senate. All of this concludes with a team project. This is a great opportunity for students to learn how to craft and implement successful strategies to manage and influence the public policy process and gain a perspective on how government and public policy can affect a company. Your program has an in-residence requirement called Kelley Connect Week. What should a student expect during this? EV: Kelley Connect week is a formative step for a first-year student. 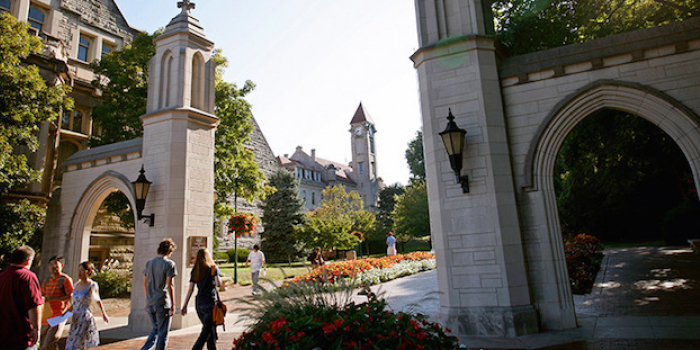 It is an intensive seven-day introduction to the program located on Indiana University’s Bloomington campus. Students benefit from this experience because they immediately begin networking with their peers. Supported by our faculty and staff, they also attend academic and career advising sessions. They are introduced to many business topics from marketing to supply chain management. Then, they are provided with a real-world business case to solve. At the end of the week, they take their learnings and present their solutions in front of representatives of the business. Students really feel they are given the chance to present in the board room – so to speak. Lastly, what advice do you have for people interested in pursuing their MBA via Kelley Online Direct? EV: Students who are considering an online MBA have many questions as they look at what is the best fit for them. Many think about the flexibility, interactions, and access to resources that on-campus provide. Students are often interested in looking at the duration of the program and how it may impact their goals and career. At Kelley, our program offers up to 5 years to complete the program. What is often a surprise is how interactive our online programs are considering our students are all over the world. Students have opportunities to network with each other and alumni during our Kelley Connect Weeks (two one-week, on-campus experiences). Additionally, students can select elective courses which also include in-person experiences both abroad and domestic. I am continuously surprised with how committed our students are to developing their network and sense of community in the online format. Both involvement in student associations and class engagement enhances their overall experience. As we talked about earlier, Propel is a great example of a traditional on-campus resource -- career advising -- that we now offer through the online MBA. Also our faculty teach courses in both our online and in-residence MBA classes. In the end, it all comes down to what students decide is the best fit for their needs. Thanks to Erin for participating. For more interviews, check out our Online MBA Report Interview Series.